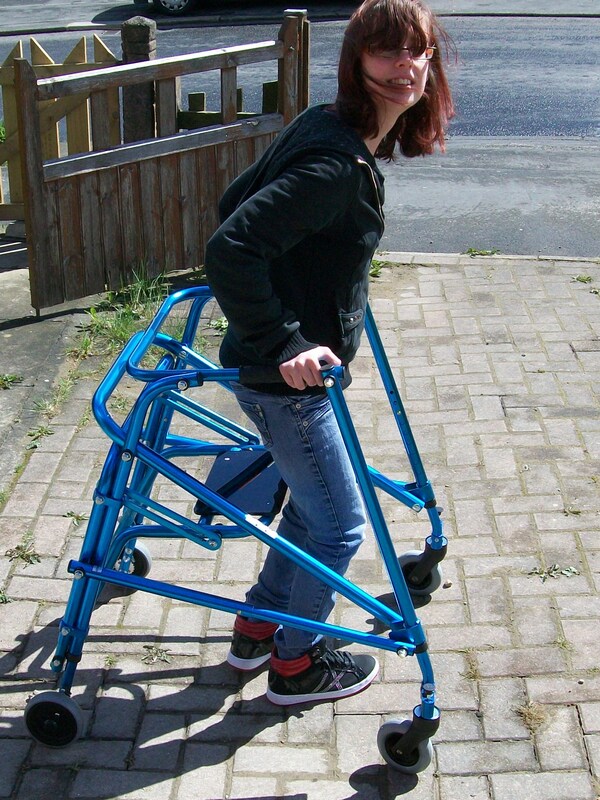 Well, I think it’s about time I introduced you all to me trusty counterpart Martha – AKA my very new, and indeed very blue, Nimbo walking frame. I know what you’re all thinking –pfft, she’s named it, why on Earth would she do that, nutter – well, I’ll tell you. I’ve always had a frame for as long as I can remember but I haven’t always given them names. That tradition started with my last glamorous aluminium-assistant Betsy who sadly had to go to walker Heaven about three weeks ago after about a year-and-a-half by my side (I’ll tell you more of her life story another time, though). Her name came about almost by accident. I was given her by the hospital the day before Christmas Eve and I was really excited because the last one was getting so wobbly that I couldn’t wait to get her. In my excitement I decided to announce to the physiotherapist that gave her to me that she deserved a name and that name would be Betsy. Enough about Betsy for now though, let’s let Martha have her moment of glory first. After a while, and many confused friends later, I decided that this should be a tradition that I would keep up. After all, when you are a child you name the teddy bear that you carry about with you all the time and lose on at least sixteen occasions while you’re growing up, so why shouldn’t I do it? And, even though I’m not embarrassed by the fact I need a frame in any way, I think it sounds nicer to ask my parents if they’ve put Martha in the car rather that saying ‘did you remember to bring ‘the frame’”. Giving her a name is great too because it helps get me out of trouble “Martha didn’t mean to hit your ankles Mum. She’s got PMT today and is very sorry, she won’t do it again”. My mum can’t help but laugh every time I pull that excuse. It’s a great ice-breaker at parties too. When I say “I’m Nic and this is Martha” they usually look at me like I’ve had one too many, then ponder on it for a minute and offer up what their own choice of name would be in my situation. I think sometimes, it helps people who’ve never met me before relax a bit and realise that they can ask whatever they want about the CP, and that I’m probably not going to mind, as long as they’re polite about it. As I said, Martha is very new to me but she’s also very special because she is the first walker I’ve ever had with a seat attached which makes all the difference. Now, I don’t have to worry about there being somewhere for me to sit so that I can take notes without falling over if I’m interviewing someone at an event, I can rest if my sister is taking too long to decide if she wants to buy that dress she’s been mulling over for an hour, and I never have to worry if there’ll be a free chair that I can use in the pub. It is these little things that make the biggest difference. Welcome to my world, Martha. We’re gonna have a blast! Don’t worry Nic. I name everything. It’s totally normal….I think. People name their cars, their boats, their computers, their plants, etc. Of course your frame should have a name!